So you want a beautifully decorated planner but you’re on a budget and can’t spend $100+ on stickers. I feel you. Glam planning is really expensive. The Erin Condren Life Planner is $50 already. Then add stickers, pens, covers and accessories and you’ve got yourself an investment. Click the link below and I’ll show you how to achieve a cute planner on a budget! It seems as if the month of February was not for me. This week was spent sick with a cold! My planner still saw a lot of love though. Check out my spread below! Another Black Friday haul! This time from KPL Plans. I saw a YouTuber using this shop and I wanted to try them out. This shop had 40% off so of course I had to buy some things. Check out my KPL Plans haul below! The package came in a bubble mailer. The stickers came inside a plastic packaging to protect them from water and damage. I wish that the stickers came in a sturdy cardboard mailer, but it was purple! Can’t go wrong with purple. KPL Plans offers both glossy and matte stickers. Matte stickers are less expensive and both glossy and matte have permanent adhesive and cannot be lifted after placement without ripping the paper or sticker. These Canceled, Rescheduled, Postponed, Not Today and Planner fail stickers ($3.75) stickers will come in handy when I write something in my planner that just did not happen. The stickers will look nicer than crossing the plan out with pen. I love the colors! I love how these Horizontal Weekend Banners ($3.75) look. I have kits that have four weekend banners in them, but sometimes there are months with five weeks in them. This will be nice for that extra week. The sampler is matte paper and has a bunch of different icons, checklists and other stickers. I love the happy mail truck! KPL Plans is still a small shop, but I hope they expand the selection soon! Over Black Friday weekend, Sweet Kawaii Design had a sale that was too good to give up. I’ve been wanting to purchase from this shop for a while, so having 10% off made it happen! Check out my Sweet Kawaii Design haul down below! The package came in a sturdy cardboard mailer sealed with a sticker. The stickers were inside of a cellophane wrapper that kept them safe from any bending or damage in the mail. The stickers are printed on permanent, glossy stickers which means they will be difficult to remove once placed down. Tesia, the shop owner, does not recommend peeling them up since they will alter the quality and color of the sticker. I have not tried it so I cannot vouch for it. The first sheet I got is the Itty Bitty Kawaii Blog Stickers ($3.95). I put a penny next to them to show the scale of the Itty Bitty stickers. They are tiny but are perfect for people who want stickers in their spreads but need room to write as well. They don’t take up much room. I do a lot of traveling between family, school and friends, so these Itty Bitty Kawaii Girl Luggage Stickers ($3.95) are great for marking those times. I love how many I get and the different colors. Most shops come with a sampler and this was no different. The sampler has a bunch of different holiday and winter themed stickers. But I guess because I ordered on Black Friday I got a second holiday sampler. I’m not complaining! I wanted the holiday lights stickers but decided not to. I’m glad that they came in the sampler. I’m very impressed with the sticker quality and how fast these stickers shipped out. I will definitely order again in the future. Have you ordered from this shop? Let me know down below! 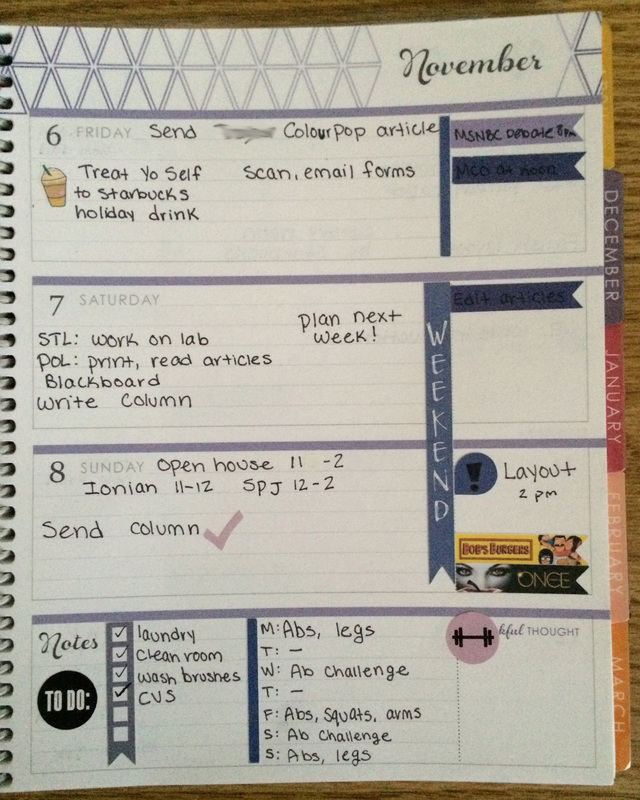 Check out last week in my Erin Condren Life Planner! More pictures are down below. There are those weeks that didn’t necessarily feel busy, but you look back and realize that you accomplished a lot. This was one of those weeks. Looking back at my planner, there wasn’t a lot scheduled, but I got a ton of things done that I am really proud of. What I love most about this spread is that I got to try out some new stickers. I started a Christmas countdown with the Have a Parade stickers I hauled a while back. They are small and don’t take up much room. They also add some Christmas cheer to my functional spreads without being too distracting. I also used a couple of Planner Kate stickers that I got in a flash sale a few weeks back. They are so easy to write on and peel off of the page when I placed them a little crooked. That’s why I love removable stickers! The weekend banner, checklists and dividers are from the monthly kits from Ladybugzdesignz. The cardboard boxes, TV stickers and smaller, skinny flags are from abundanceoferica. The birthday stickers come in the Erin Condren Life Planner. What is your favorite part of trying new stickers? Let me know down below! I’ve always wanted to order from Planner Kate, so when I saw that she had a 40% off flash sale last week, I had to take advantage. Check out my first Planner Kate haul below! All Planner Kate stickers are printed on matte, repositionable sticker paper. I love this because matte paper is easier to write on and if I want to move a sticker around, I can do so without ripping the paper or leaving behind adhesive. The stickers are cut perfectly and I don’t see that any ink smeared in the printing process . What I am upset about is that the USPS bent my package a bit and as you can see below, some of the sheets are curling. Despite the curling, the stickers lay flat. I ordered on Nov. 22 and the package was shipped on Nov. 24. That was really fast! I got the order on Nov. 27, but since I shipped it to my school, I couldn’t pick up the stickers until after. Some shops take weeks to ship out stickers, but this shop shipped the stickers incredibly fast. The color selection is really nice here. The colors work really well with the Erin Condren horizontal planner, which is what I use. Some colors don’t match the monthly colors exactly (pink), but they work perfectly for every other monthly color. I can see these working well with the vertical as well. These appointment labels ($5) work well to mark off important meetings and appointments. Mark the time in the square on the left and write the appointment or meeting in the blank white box. These are super skinny and don’t take up much space. I want to use these laptop icons (sold out, similar) to mark when I have to work on my blog or when blog posts go up. I love how clean these look and how vibrant the colors are. Half boxes ($5) are great for marking off an important meeting, appointment, date or event. I like to use these when an issue of my school’s newspaper is out. I wish there were two of every color, though. There’s only one dark purple, orange, lime green and coral yet doubles of others. Planner Kate is known for their double dot stickers, but these single dots ($5) are just as nice. I like to use these to mark off when class is canceled, when I’m meeting with a group to work on a project or when I’m meeting with friends for lunch. I really like the variety of this sampler that came free with my order. Usually shops give out samplers that have to deal with the season, and while those are nice, sometimes that season has passed and aren’t usable until next year. This one has functional stickers and decorative stickers in all sorts of shapes and colors. I cannot wait to use that sequin half box in my January spread. Although Planner Kate stickers are expensive at $5 a sheet, I’m going to order again – but only when there is a sale. These stickers are of nice quality, shipped fast and work well with the colors of the horizontal. Have you purchased any Planner Kate stickers? Which ones? This past week marked the beginning of my short but relaxing Thanksgiving break, and boy did I need it. Since I only had to plan out two days for school purposes, I was allowed to have a little more fun with how I did my layout. I usually don’t use checklists in my weekly spreads except in the Notes section, so using them throughout spread felt a little foreign to me. However, since those days I was doing errands and buying Christmas gifts, the checklists made sense. Since I use my planner functionally, I don’t add decorative stickers to my weekly spread and instead use them in the monthly view to add a bit of fun. I really love the way the turkey and fall stickers look though. It adds a bit of color to my usually monotone spreads. Sometimes I wish I could be a decorative planner, but I need all the space to plan out my days! I love the way that Cindy Guentert (Llamas Love Lettering) does lettering in her planner, so I thought I would try that out too. I love the way it came out! Monday was a really lazy and relaxing day for me since that weekend was crazy with work and school events. I want to buy markers to color it in. I think that would look really nice! The weekend banner, checklists, dividers and icons are from the monthly kits from Ladybugzdesignz. The smaller teardrops, TV stickers and smaller flags are from abundanceoferica. The turkeys and decorative stickers are from a Darice sticker book which are easily found for $1 at Michaels. 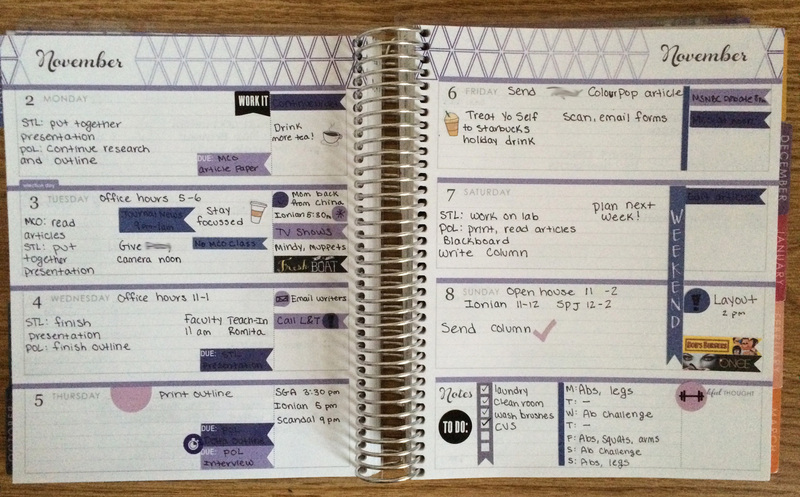 What do you do to your planner to spruce it up and have a bit of fun? I haven’t bought new stickers for my planner in a while, so I decided to treat myself to a couple of stickers from Have a Parade. Have a Parade is an Etsy store that specializes in stickers for the Erin Condren. Her stickers are affordable and come in such vibrant colors. All stickers are printed on glossy, permanent paper. I received a small sampler as well that included some decorative and functional fall stickers. With Christmas coming up, I wanted to get some countdown stickers ($3.50.) What made these stickers stand out to me was that each sticker has a different icon in it. Most of the countdowns I found on Etsy had the same icon for the entire countdown, and that didn’t seem like much fun to me. While the icons do repeat, it’s not in the same week and that’s fine with me. The stickers themselves seem smaller than what I thought they would be. I thought they would fit across the length of a Erin Condren box, but they are much smaller. However, this is fine with me because it won’t take up that much room. I also bought some functional stickers. These small banners ($3) will be perfect for writing the time of an important appointment or for marking off a special occasion. Shipping was relatively fast. I got these in about a week from when they shipped, which was two days after I placed the order. And considering they came from California to New York, I’m fine with that! I’m excited to use new stickers in my planner and get ready for Christmas. It’s my favorite time of the year! Are you doing anything interesting in your planner to celebrate the holidays? Let me know down below! It’s that time of the semester that I’ve been dreading: my three research papers are due in four weeks. I have a 15 page paper for my science class, an eight page paper for my political science class and a 15 minute presentation and paper for my mass communications class. And they’re all due the same week. Last week was all about writing outlines and finishing up small papers and assignments so I can focus on my larger papers and projects. Thankfully I got out of this week unscathed and all of my papers were submitted on time. My stickers are the same as last week. The skinny flags, due stickers, TV show flags andsmall tear drops are from abundanceoferica and the bigger flags, checklist and color-coordinated icons are from LadybugzDesignz. The “to do” sticker and then pink stickers are from a Happy Planner sticker book.